This film was marketed as a comedy. Yet it is anything but comic. It’s a fairly accurate portrayal of the struggle for artistic control of the Disney classic Mary Poppins. Everyone knew, even in the sixties just what type of films Walt Disney made. And if you were a rather dour Englishwoman with a limited world view than you would not be amused. This is the basic tone of the film. It’s not amusing, and it’s rather sad at times. It’s also full of distracting flashbacks and that is one of the reasons the film doesn’t work. The author, PL Travers, played by Emma Thompson is seen as a young girl who worships her father. We see her again as an embittered middle-aged woman with a joyless existence. The two characters are never reconciled in a satisfactory manner. There is no “hook” that convinces us this is the same person. In the film, Capote there is a device used where the character of Truman Capote is seen as regressing to a different time in his mind, and the device they use is a jar of baby food he uses to drink his booze. There is a similar sequence in this film using pears, and it is doesn’t come across in the same manner. This takes great editing and even better scripting. This film needed some work. The child that was Travers is a sweet and innocent vision completely enamored of her charismatic and charming father, played by Colin Farrell. There is no trace of humor or softness in the character of the woman that is PL Travers. She doesn’t endear herself to the Disney people nor to the audience. 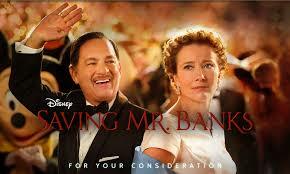 Tom Hanks is spot on as the charming Walt Disney, bent on cajoling and charming Travers into submission. But his time spent on screen relegates him to something of a minor supporting character. Thompson carries the movie, and she does an admirable job. The film in tone is much closer to Remains of the Day than any of her other work. In another Thompson vehicle, Nanny McPhee, it was billed as a lighthearted attempt to entertain, and this film is marketed in the same vein. But it’s a sad portrait, accurately done, about a writer’s struggle for control. And also about a woman who cannot let go of the past. These dramatic storylines don’t ever let us forget the sadness and the sorrow she carries. And then, there is never really a satisfying denouement or closing. Rather like Remains of the Day, the sadness and emptiness of the characters are the only takeaways allowed.